So who doesn't like pancakes? Even if you don't like to eat them, Pancake Tuesday, or more correctly, Shrove Tuesday, is a great day to get the camera out and do some food photoraphy! I've never had an awful lot of success with my food images, but practice makes perfect, as they say, so before I tucked into my lunch, I took the opportunity to try and make a decent image from my meagre cookery skills! To my surprise, my pancakes turned out quite well, so all I had to do was arrange a pleasing composition and I'd be halfway to achieving my objective! After trying numerous shots of the pancakes stacked and folded on a plate, and not being happy with any of them, I decided to try something different. 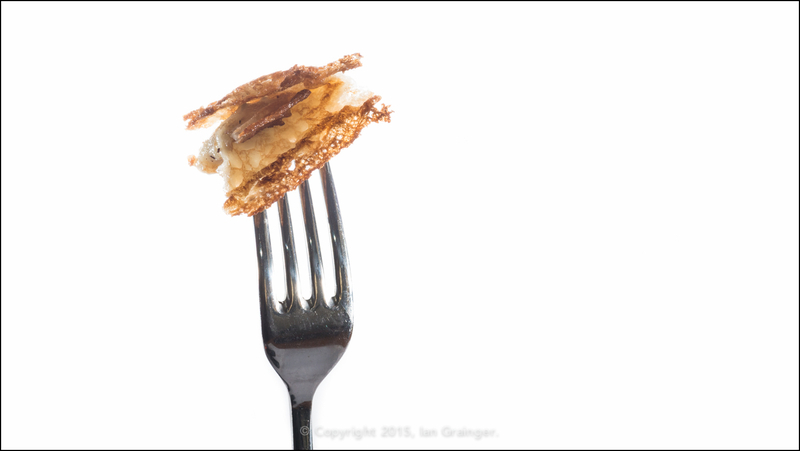 I placed part of a folded pancake on a fork, and hey presto, I had my image! Just goes to show you should never give up on a photoshoot, as I think this works quite well! What do you think?